ALBANY — On Wednesday, Steven Ognibene had to take the day off work. 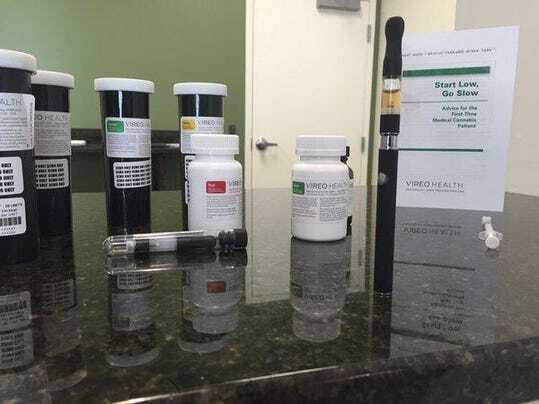 The Rochester surgeon needed to drive three hours to the Binghamton area because the type of medical marijuana that could help his 11-year-old son, Vincent, wasn’t available locally. It was, though, available at a dispensary in Johnson City. By the middle of 2017, the health department also expects to allow five more companies to grow and distribute marijuana – a move to increase access in areas of the state without dispensaries. The state also said it’s working to make public a list of doctors who are registered with the state to prescribe the drug – something advocates have been clamoring for. The tight timeframe – the companies had 18 months to grow and distribute the product in time for the January opening – coupled with the limited ailments that could be treated with the drug led to a slow start for the program. Twenty-eight states and Washington D.C. have legalized medical marijuana, and New York officials said it has looked to other states in implementing its law – to either avoid pitfalls or note good ideas. Hintz’ five-year-old daughter, Morgan, suffers from severe epilepsy and takes a strain of medical marijuana not currently available in the state. “It just seems like a real simple solution,” Hintz, who lives in North Salem, Westchester County. — The state has about 770 physicians registered in the program and about 11,000 patients since it started last January. — To register, a health professional needs to take a $249, four-hour online class; patients need to get certified by a registered practitioner and sign up with the state. — The state has 11 conditions that qualify for medical marijuana usage: chronic pain, cancer, HIV infection or AIDS; Lou Gehrig’s disease; Parkinson’s disease; multiple sclerosis; spinal damage; epilepsy; inflammatory bowel disease; neuropathies; and Huntington’s disease.